A loud abrasive buzzing bellows from the nightstand and I raise my head, only to be blinded by the red light emanating from the small—in size, not volume—machine against a backdrop of pure blackness. 4:00 A.M. Oy. I’m immediately beset by the eternal morning conflict: ten more minutes of sleep vs. the rush of adrenaline that wants to start the adventures that await. The latter quickly usurps the former as I realize today is September 25th, a day I’ve waited for my entire life (metaphorically speaking) and actually been counting down to since the spring. 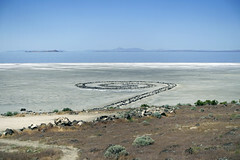 It’s Spiral Jetty day. 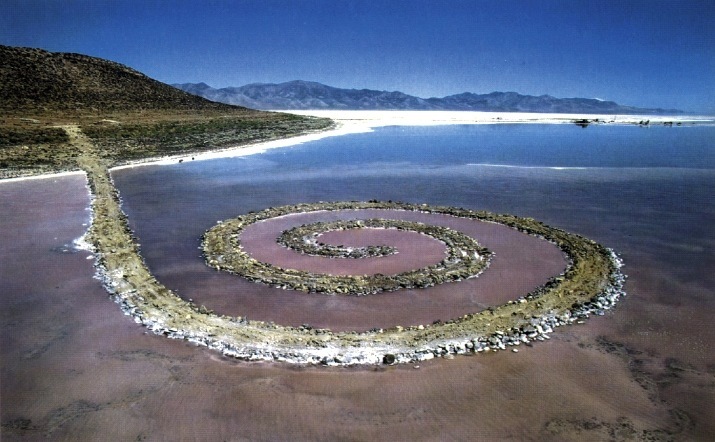 I bound out of bed, Gianfranco Gorgoni’s seminal photograph of Robert Smithson’s iconic earth work on repeat in my head as I shower and “pack” for the daylong adventure that will take me to a remote area of Utah. I meet the rest of my party at the gate at LAX and it’s immediately clear from the conversation that we’ve all arrived at this moment with decades of expectation accumulated. How would the experience compare to the visions (particular to each person) we had all conjured up over the years? Would the jetty “deliver” the transformative experience we all sought? Or would it fall victim to a case of excessively high and unattainable expectations? Time would tell. But, it would indeed take time. 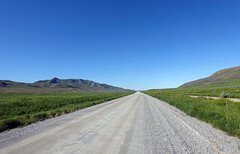 An hour at the airport, followed by an hour plus on the plane, then a two plus hour bus ride over the bumpiest “trail” – it certainly wasn’t a road! — imaginable, and ultimately a fifteen minute hike. Nearly eight hours after my day had begun, it came into view. 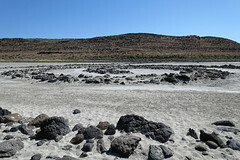 At last, Spiral Jetty. But…it was so…so…so small. That couldn’t possibly be it! Naturally the distance made the work appear smaller and it “grew” as we approached, but even as we stood perched on the rocks right above it, it seemed utterly dominated by the landscape. 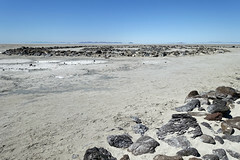 Yet another surprise, the water from the Great Salt Lake no longer permeated the rocks, but was a significant distance beyond. Between the Jetty and the lake, there was a blanket of white – a picture-perfect postcard image of a quiet winter’s morn, and yet, the “snow” wasn’t melted by the sun blazing down from above. 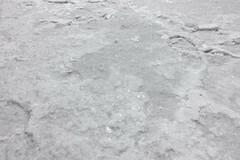 Upon closer inspection, the “snow” was actually crystallized salt that brilliantly reflected the sun’s rays and the nearby water. 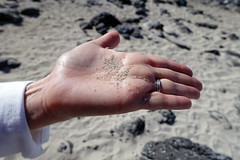 We walked about the Jetty with the sun hot upon our skin, the smell of the salt air filling our nose and lungs, and the feel of salt crystals on our fingers (having knelt to examine the minerals that carpeted the environ). An all-consuming, olfactory experience. 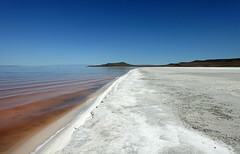 We then decided to make our way across the white blanket to the water’s edge, fighting off fears that the salt, which had the distinct characteristics of ice—would “break” and we would plunge into the Great Salt Lake below (which was a physical impossibility since the water wasn’t below). From a distance the water had appeared a brilliant blue, but as we neared, gradations of color began to appear – shades of blue, purple, pink, and red – a traveler’s mirage, of sorts, and undeniably picturesque. We found our way up to a piece of land overlooking the jetty and sat down on the rocks to enjoy our sandwiches and “debate” Smithson’s intentions and ethical issues in conserving the work with several scholars. 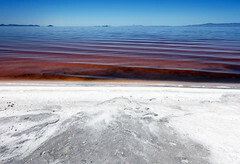 One of them compared Smithson’s Spiral Jetty to Monet’s Rouen Cathedral series which conveyed the same location at various times of day so that he could capture the specific lighting and other nuances of a particular moment. He said, “Smithson’s doing that here but he’s not doing it on canvas, he’s doing it out there in the elements themselves…it has that same type of specificity too it, and yet specificity that is subject to all kinds of permutations.” The question was raised about Smithson’s vision for the work, his view on its ephemerality, and whether he ever envisioned groups such as ours making the journey out to this incredibly remote location to experience his work. We were reminded that the physical jetty is only part of the work, which is actually a triad of the “sculpture” in the landscape, an essay by Smithson, and a film documenting the project. But, as time has marched on, the work has become embodied in the minds of the general public in a single photograph, the aforementioned image taken by Gorgoni who hovered about the work in a helicopter and captured the piece from the perfect angle so that it looked colossal, while the hills looked minuscule. This is due, in large part, to the fact that the jetty became submerged only a few years after it was made, and remained that way for decades. Only in the past ten years has it resurfaced and been “available” for visitation. Though Smithson may not have ever intended or even considered that people would take the time (and trouble) to visit, which begs the question that Loe posed to us, “Who is this work for?” Coolidge said the work was for Gorgoni, that Smithson had literally made it for the photograph. They all agreed that the sculpture itself is the “gesture,” but the documentation is every bit as much a part of it. 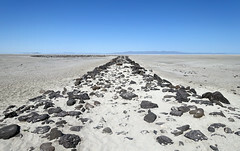 Up until that moment, the essay, the film, and the Gorgoni photograph were the entirety of my experience with Smithson’s Spiral Jetty, which is probably true for all but a small population who’ve sought out the physical experience of the “gesture.” An object whose identity is so deeply intertwined with its documentation is fraught with complexities and paradox, but given interest in ephemerality and entropy, I’d imagine he’d be quite satisfied with the transient nature of his jetty—how it disappears and reappears at nature’s will. Such is the foundation for arguing against any conservation of the earth work, and allowing it to emerge and submerge with the tides. And yet, the thought of the work vanishing for another thirty years beneath the lake devastates me. With this debate reeling in my head, I made my way back down to the jetty. If I couldn’t be certain the work would be here waiting for my return in the distant future, I’d better take another promenade on the rocks. This time I separated from my friends, put down my camera, and walked the spiral in absolute silence. Though physically alone, I felt the overwhelming presence of several invisible companions: Mother Nature herself, the spirit of Robert Smithson that is somehow pervades the rocks, and God. I thought about each of them in a way that the loud noise of my crowded, urban existence prohibits. I found the transcendental calm within that often only comes to me upon reading an Emerson poem, hearing a choir sing “Amazing Grace,” or staring into the floating color-field abyss of a Mark Rothko painting. I began the walk back to the bus with my colleagues. We found ourselves humbled by the beauty of nature and the power of art, and hailed Smithson for giving us a reason to find our way to this breathtaking place. On the bumpy ride back towards town, I realized that I had made a pilgrimage in search of a monument, an icon of culture and history, but found pleasure in the aesthetic of transience instead. 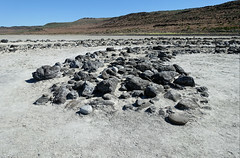 Spiral Jetty looked nothing like I’d imagined – a.k.a. the Gorgoni photograph – and I’m grateful. Grateful because I saw the work on September 25, 2010 and no one will ever replicate the experience of seeing it on that day, for it reinvents itself with every change of light, tide, and weather. Cite this page as: Rebecca Taylor, "Robert Smithson, Spiral Jetty," in Smarthistory, September 18, 2016, accessed April 21, 2019, https://smarthistory.org/robert-smithson-spiral-jetty/.